OUT OF STOCK Total snake protection from ankle to thigh. Ideal for hunters. Finally, comfortable snake chaps that you can actually wear for a full day of hunting or hiking! TurtleSkin SnakeArmor Total Protection Snake Chaps are surprisingly lightweight and flexible and provide peace of mind that you are protected against a potentially deadly snakebite. These Chaps allow you to walk through underbrush and tall grass with confidence. Total Protection Chaps protect up to the thighs providing you protection against longer snakes that can strike above the knee area. Feel safe and comfortable enjoying your time outdoors. 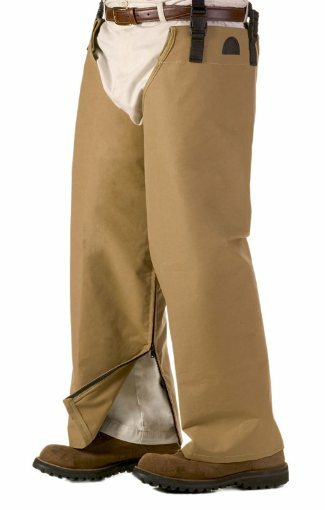 TurtleSkin Total Leg Protection Snake Chaps offer your entire legs full protection from snake bites, thorns, and briars, yet are incredibly lightweight, comfortable, and breathable. TurtleSkin SnakeArmor Total Protection Snake Chaps provide snake and thorn protection from your ankle up to your thigh. These chaps are constructed from a patented super-tight weave of high-strength ballistic fibers and polyester. Weighing in at less than a third the weight of other snake chaps, these flexible chaps are the lightest and softest snake resistant chaps on the market. Choose size and color from drop down menus. Choose Short if you are 5'7" or under. Choose Regular if you are 5'8" - 6'0". Choose Long if you are 6'1" or taller.